An artist's concept of how on-demand aircraft could be integrated into daily life in different communities. Uber Technologies Inc., the company behind the popular car service app, is once again partnering with NASA, and this time, it's supplying information to the agency so that it can simulate the flight of a small passenger-carrying aircraft within the airspace of Dallas Fort Worth International Airport, according to two recent statements by NASA. Jaiwon Shin, the associate administrator for NASA's Aeronautics Research Mission Directorate, highlighted the merits of UAM in a May 8 statement, comparing it to the smartphone revolution. 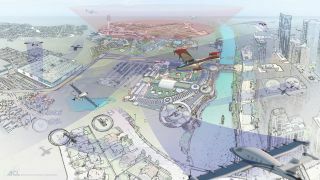 An artist's concept of an Urban Air Mobility environment, where air vehicles with a variety of missions can interact safely and efficiently. Research will also look into preventing these vehicles from creating too much noise, in addition to ensuring they don't overburden the national air-traffic-control system. To accomplish those goals, UAM researchers are pulling in information from related areas of aeronautics. For example, developments in all-electric or hybrid-electric aircraft could allow for relatively quiet flying-vehicle operations, as well as low emissions. And according to the May 7 statement, UAM researchers are also partnering with the Federal Aviation Administration to develop rules and procedures that can manage low-altitude flying.